Massage has been practiced as a healing therapy for centuries in nearly every culture around the world. Although massage affects the body as a whole, it particularly influences the activity of the musculoskeletal, circulatory, lymphatic, and nervous systems. Through muscle manipulation massage can help to relieve muscle tension, reduce stress, and evoke feelings of calmness. Whether it is a swedish massage, deep tissue massage, sports massage, pregnancy massage or even a hot stones massage you need our qualified massage therapists can help. Natures Spa is a massage centre that has been based in Hendon Central for over thirty years providing the best possible treatments to its clientele. PLEASE NOTE : At Natures Spa pre-blended aromatherapy oils are used for all massage treatments. Please advise us if you would like a plain unscented oil to be used. Traditionally a very relaxing massage that uses a holistic approach, this technique helps to balance the mind and body. A traditional full body massage, which uses a holistic approach, using flowing massage stokes to relax and revive muscles, release tension and leave you feeling invigorated and relaxed. When scheduling your appointment please advise us if you are pregnant or suffer from any medical conditions as this may affect your treatment. A deep rhythmic pressure massage that alleviates stress, eases aching muscles and joints all over your body. Deep tissue massage focuses on realigning deeper layers of muscles and connective tissue. It is especially helpful for chronically tense and contracted areas such as stiff necks, low back tightness, and sore shoulders. Some of the strokes used in Deep Tissue Massage are similar to Swedish massage, but the movement is generally slower and the pressure is deeper and concentrated on areas of tension and pain. Deep tissue techniques vary from therapist to therapist. A customised blend of essential oils extracted from flowers and plants are used according to your individual needs to perform this therapeutic all over body massage. 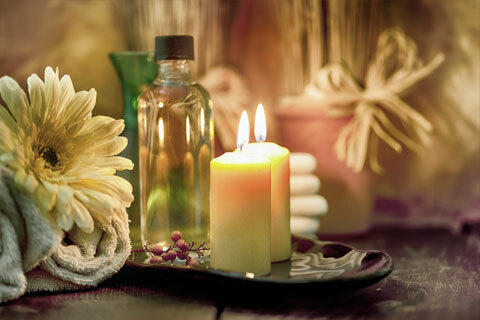 Aromatherapy is the use of essential oils extracted from flowers and plants combined with massage to improve health. The goal is to relax the entire body with classic massage techniques while using a specially formulated oil blend for additional health benefits. Sports Massage therapy helps to alleviate the stress and tension which builds up in the body's soft tissues during physical activity and exercise. Sports Massage is not a relaxing massage and can be vigorous. It is designed to prevent and relieve injuries and conditions that are associated with exercise. A special treat for mums to be, to help relieve the common aches and pains associated with pregnancy. Only our fully trained and qualified therapists in this specialised field carry out this treatment. Mothers- to- be experience stress and pains as a result of increased weight, a change in hormonal levels and shifted posture. Regular massage intends to alleviate these symptoms amongst others. A happy pregnant mother transfers this joy to her baby. Pregnant women in the first 12 weeks should avoid receiving any treatment, after which massage during pregnancy is encouraged to relieve aches and fatigue. Please note if you have suffered any complications during the pregnancy it is advisable to seek medical advice before having a massage treatment. Our therapists are unable to provide medical advice. This treatment focuses on the specific tension areas of the back neck and shoulders. A Deep tissue massage focusing on realigning deeper layers of muscles and connective tissue. This treatment is tailored for the chronically tense and contracted areas of the back, neck and shoulders. 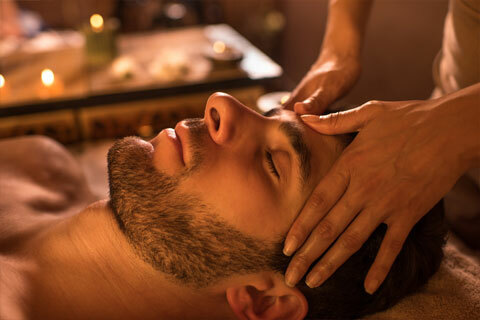 Indian head massage is an ancient form of massage known to relieve tension from your shoulders, neck, head and face and to balance the mind and body. Indian head massage, also known as Champissage, originated in the East more than one thousand years ago. It was developed by women who used it to strengthen and improve the scalp circulation and the fullness of their hair. Over the years other parts started to be included in the head massage: the face, neck, shoulders, back and arms. The specialised art of massage focuses on stimulating specific pressure points on the feet, which correspond to individual parts of the body. Reflexology is a branch of massage that focuses solely on feet but this is a treatment for your entire body. During your session, your therapist will stretch and move the feet, applying pressure on reflex areas that correspond to specific organs and other parts of the body. By stimulating these reflexes on the feet, it will encourage the body to work naturally to restore its own healthy balance. Relieve the deepest aches and pains with this full body massage which uses smooth volcanic hot stones from Hawaii. Hot stone massage is a highly effective therapeutic massage therapy that not only relaxes but also alleviates pain, stiffness, and tension in the muscles. It is similar to any other massage treatment, but it uses hot stones in the process. The stones are only used at safe temperatures and they penetrate deep within the muscles in a way that most massage treatments are not able to. It soothes tight & tired muscles. Reducing tension & the effects of stress.